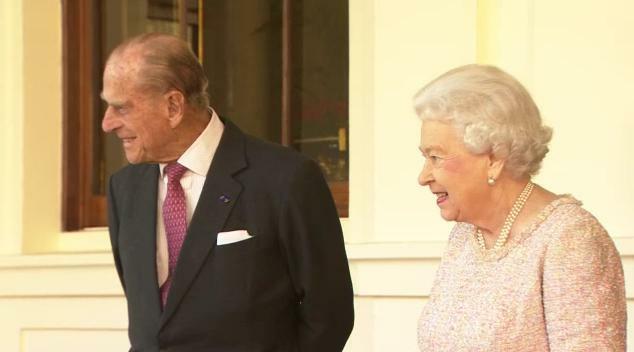 The Queen and The Duke of Edinburgh bid farewell to the President of Colombia and Mrs. Santos as they left Buckingham Palace during their State Visit to the United Kingdom. There's no brooch! But don't worry, we'll get to it. The Queen later visited Newmarket, where she unveiled her 90th birthday gift from the town, a statue of herself with two horses. She also opened the new National Heritage Center for Horseracing and Sporting Art. She just left it on her jacket, see. I love the idea of her wearing a gift from her parents when enjoying a day celebrating her support of racing, which is an inherited interest. Not that she needs a reason to wear this favorite gem, of course.